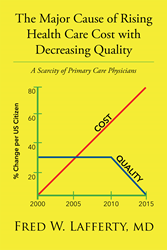 Recent release “The Major Cause of Rising Health Care Cost with Decreasing Quality: A Scarcity of Primary Care Physicians” from Page Publishing author Fred W. Lafferty, MD. is an informative, enlightening work about the inequality and faults in the nation’s health care system. The book showcases the increase of healthcare costs and the decrease in quality of care. Fred W. Lafferty, MD., a retired medical doctor, published medical writer, previous clinical professor of medicine and author, has completed his newest work “The Major Cause of Rising Health Care Cost with Decreasing Quality: A Scarcity of Primary Care Physicians”: a gripping and educational work that depicts the politics of medicine. Published by New York City-based Page Publishing, Fred W. Lafferty’s prolific work delves into the ideas of a profit motivated health system and the monopolies of large hospital chains. Since 2000, the author has observed the soaring costs of health care in the United States which has accompanied a decline in quality of care for the average citizen. This has been the result of the intrusions of Medicare since 1985, the profit motivated private health insurance companies, the development of large corporate hospital chains, and the irresponsible increased cost of medications by the pharmaceutical industry. In 1985, Medicare mandated what physicians could charge with a clumsy coding system, which essentially socialized medicine. This system heavily favored the procedure driven specialties to the detriment of the primary care doctor. During the past thirty years, the percentage of American Medical School graduates entering primary care has diminished from thirty-five to five percent resulting in a scarcity of family physicians. Despite America's outstanding medical schools, academic physicians, and technology, the United States ranks from fifteenth to thirty seventh among the industrialized nations of the world in quality of care and longevity of its population. Regardless of Obamacare's promise to provide healthcare to most US citizens, it will fail unless at least fifty percent of America's physicians enter primary care as in Europe. Our fault lies with allowing the Medicare bureaucrats unrestricted power since 1985. Readers who wish to experience this profound work can purchase“The Major Cause of Rising Health Care Cost with Decreasing Quality: A Scarcity of Primary Care Physicians” at bookstores everywhere, or online at the Apple iTunes store, Amazon, Google Play or Barnes and Noble.